Whether we’re ready or not, the holidays will soon be over! With all the preparations, parties, errands and hustling around it’s hard to think about the after-math insanity. Putting the tree away, taking down the lights, exposing of ten tons of wrapping paper, and keeping all our precious decor safe until next year. 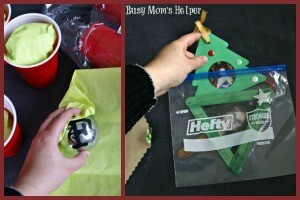 To give you a little help, here’s a handful of tips on How to Store Ornaments with Hefty! Sometimes I find it ridiculous how many different shapes, sizes, and levels of fragility our Christmas ornaments come in. Even all of our regular old round bulbs are larger or smaller! I use to just put them all in a few boxes, with tons of stuffing to (hopefully) keep them safe. I’ve since learned, and can now use some common on-hand Hefty products like disposable cups and plates, plus baggies, to keep everything safely stored…plus it takes up a lot less space than all my crazy cramming! Grab some disposable cups and tissue paper. It doesn’t HAVE to be festive red and green like I used for these…it’s just what I had on-hand! Wrap each ornament in tissue paper then place it into a cup. Especially with round ornaments, you can fit more than one per cup. For this you need some good plates, like the foam Hefty ones I had. Especially if there’s a chance they’re fragile (even in some parts of the ornament) it’ll give more protection all around. Place it in the middle of one of the plates, then put another one over top. Tape the plates together around so it stays closed. My kids have a TON of flat ornaments, especially with photos, that they’ve made throughout the years. I definitely don’t want these bent! I simply slide one to three inside a baggie of appropriate size (some gallon, some quart, etc.) and zip it closed. Stays nice and flat! Now you can place them stacked neatly in a box, taking up MUCH less room than randomly placing them in with a mess of wrapping for protection, and all using basic Hefty items you probably have on-hand anyway. I love knowing that my ornaments will stay safe throughout the year until we break them out again. This will also make it easy as pie to pull out the NON fragile ones for the littler kids to hang up, and Wonder Woman will know the cups hold ones she can help with! Bonus! Want to know even more tips on how to store other ornaments? Then head over and see these TIPS! This review was made possible by Double Duty Divas and Mr. Clean. I was provided the featured product and compensations to facilitate this post, but all opinions are 100% mine. I hate cleaning. Like, REALLY hate cleaning! I pretty much did a dance when I realized my kids were getting old enough to do more chores by themselves, some with supervision. I tend to let laundry pile up for days, until I HAVE to put it away because everyone’s out of clean clothes. I’m terrible at leaving the sink full of dirty dishes (luckily Hubby is amazing and does them 95% of the time). Vacuuming my bedroom…well, let’s just not talk about that. I do want my house to be a little more clean for the holidays, though, because friends and family tend to come over more often. I’m not willing to spend forever on it, though, so luckily there’s a way to Get Your Home Holiday Ready with Mr. Clean Magic Eraser! I’ve always had a love for Mr. Clean Magic Erasers, because they work on so many things! Whether I’ve got a scratch in the floor, dirt spots on the wall, or random messes (tends to happen with kids, apparently) it’s my go-to cleaning tool. Plus, they do feel pretty cool! There’s several spots around the house that have been quite the eye-sore for awhile, so in my mini-cleaning spree for the holiday’s I ran around attacking them all with my trusty Magic Eraser. The door frames are now shiny, compared to the yucky spots before…. And Wonder Woman’s door had all SORTS of dirt, spray spots from her random art projects, and whatever else all over her door! I’d say she rubbed a black shoe against it for this smudge…but it was way up by the door knob. I love how the Magic Eraser buffs out random spots and dirt, making the white actually LOOK white on our doors! Yes, this is another from Wonder Woman’s room…she tends to be quite messy with all her art stuff! Even tons of those black shoe-like smudges inside the door frame on her bathroom…what the heck? Lucky for me (and for her) a quick rub with Mr. Clean and it was like new. Another of my favorite, and most common, uses for it are stickers. I hate all that gunk they leave behind on things! This sticker was on my pretty black chair in my craft room….not sure HOW it didn’t bug me for the past 7 years I’ve had the chair…but it was time for it to go. Scrub, scrub, and away with it! If I wasn’t totally sold on the MAGIC of this eraser, I am now! 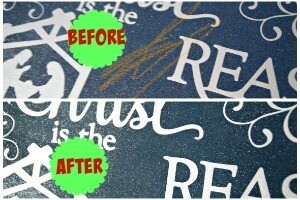 Even the sprayed-on sparkles are still there, it didn’t even scrape up the vinyl lettering, and the colors look perfect. I later asked Hubby if he could see where the kids marked on the sign….he had no idea what I was talking about after inspecting it. LOVE! Did you know there’s about a MILLION uses for the Mr. Clean Magic Eraser? Here’s a little video to get your brain going…. #10,101: Want an inexpensive holiday decorating tip? Draw fun designs on the outside of your glasses or serving bowls with bright-colored Sharpies…at the end of the night, simply rub it off with Mr. Clean Magic Eraser. #3,459: You know that annoying, sticky residue left on holiday toys and decor by price tags? Gently wipe with Mr. Clean Magic Eraser and, viola, it’s gone! #3,155: Candles are beautiful on a holiday table but waxy residue can leave such a mess. Pick the bulk of the wax off and then gently scrub with Magic Eraser to help remove melted wax. Win Mr. Clean Magic Erasers & a $50 AMEX Gift Card! Holy cow, our house was quite the mess the last few weeks! With all of us coming down with a really terrible cold, I really let the housework slide. Now that we’re feeling a bit better, it’s time to get this place more ready for the holidays! I love getting my kiddos involved, and they actually love it! 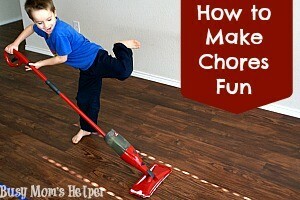 Here’s some tips on How to Make Chores Fun: Floor Cleaning to Windows. Now, our biggest issue with keeping the house clean is that we have a LOT of wood floors…basically our entire main floor! With the food messes the kids leave each meal in the kitchen, to the dog hair and dried grass that our two large dogs drag all over, it gets REALLY yucky on our floors despite how often we try to keep it cleaned! To tackle this job for our ‘Get the House Holiday Ready’ family mission, we needed some help! We ran to Walmart, hit up their cleaning supplies section, and grabbed the O-Cedar ProMist. I wanted this model because it has the nice microfiber cloth, which picks up pretty much everything from the dog hairs to crumbs to leaves. I also LOVE that you don’t have to use a specific type of solution for the fluid…you can put in whatever you’re needing at the moment! Sometimes we just need some water for a quick clean-up, other times we use our ‘pet’ cleaner for their little accidents. I even mix some disinfectant cleaner with water and put that in the ProMist when I want a nice, deep clean! I’m a bit nervous to show this….but I want you to see how well it picks stuff up…. Gross, right? Anywho…once you’re done, you can just toss it in the laundry and reuse it! No need to purchase more pads or anything. The absolutely best part? Our kids usually do our floors for us! It’s one of the chores they really love doing, and this mop makes is super easy for them…and does a great job even if the kids aren’t the greatest little cleaners. It was Superman’s chore to clean the downstairs floors this week, and he had a blast….check out his awesome dance moves! Yup, he’s a total ham! Yet, despite all his jumping and silliness, the floors got amazing clean! If there were any spots that needed a little extra scrubbing (like sticky candy stuck there), Hubby stepped in to give a little extra muscle. I love clean, shiny wood floors, don’t you?! I wish the dogs would let it stay that way…. Have a reward system, like our chore chart or our chore rewards treasure chest. Some chores are just to help out as part of the family, some are actual ‘paid work’. Have a specific morning each week (ours is usually Saturday) where everyone helps clean. Get a little treat afterwards, such as donuts or a drink at the gas station. Let each of the kids have a cute ‘cleaning outfit’, maybe an apron, that they get to wear while they clean. Act like ninjas! Tell the kids the mess/germs are the ‘Bad Guys’ and they need to ‘ATTACK’ them! You’ll be surprised how fiercely they clean! Turn up the tunes! It’s always more fun to clean while dancing and singing along. Hide a little ‘reward’ in the area they’re cleaning. Finding a little candy while mopping or a quarter while dusting can really get them motivated. Play ‘go fish’ with your socks while doing laundry! Do a ‘Ten Minute Tidy’ before dessert. Set the timer for 10 minutes and everyone does as much cleaning and organizing in that time as they can. Everyone who joined in gets to enjoy a yummy dessert! Get a plastic police badge for cheap, then take turns being ‘Inspector D. Clutter’. The inspector can go around with a box/bag and put stray items in ‘jail’ (the box/bag). For the guilty parties to get their jailed items free, the owner must do a chore. There’s so many more fun ideas, just let your imagination go! Above all, make sure your children receive positive reinforcement for a job well done…or at least for good effort! Don’t expect them to do as well of a job cleaning as YOU can do, but little by little they’ll get better. This shop has been compensated by Collective Bias, Inc. and its advertiser. All opinions are mine alone and should not be taken as medical advice. #HealthySavings #CollectiveBias See my Disclosure Policy for more information. When you think of organizing, you probably think of paperwork, laundry, storage, even the kitchen or your DVD collection. Does anyone think of their medicine cabinet? I didn’t use to, just had random medicine on-hand and grabbed stuff at the store when we really needed it. Last winter, we learned the hard way that it’s important to plan ahead, and do your best to Stay Healthy This Winter with Free Printable Medicine Trackers! Last December, the news had reports of an ice storm coming in. Now, it was our first winter in Texas, and we had moved from northern Utah, so we just thought ‘whatever, I bet it’s nothing compared to what we grew up with!’ It’s a little different here, I guess….because when they say ice storm they mean ICE storm! Overnight, we got a layer of ice several inches thick covering the ground outside. There was no stepping outside, because all you did was slip and slide, not able to get a footing on the slick ground. Forget about driving anywhere, or you’d end up in the gutter or worse. We were stuck….and some of us were getting terrible colds! The quick change in weather must have really hit our systems, because after the first day we were coughing, sore throats, and some fevers. Well, guess what? My unorganized medicine cabinet was missing a ton of the things we needed to help our kiddos feel better….and half of it was expired. NOT a fun half a week of being trapped indoors feeling like crap. Although we did the best we could and made LOTS of fun memories (we also hadn’t grocery shopped before the storm, so created some really interested meals as a family) I would rather be more prepared next time. Since that painful (literally!) learning experience, I’ve gotten my medicines organized and created a couple cute tracker pages so I can KEEP it organized. First step, head over to your local Walgreens to stock up on the Pfizer products your family uses. If you have a large family, like we do, some items may not last long when a cold hits your household, so more than one may be a good idea. Want to save some money while you’re at it? Grab the November coupon booklet in-store and save up to $10 on select Pfizer products such as Dimetapp, Advil, Chapstick and more! Don’t forget to include items for cough, cold, allergies, flu, and more! If you do end up sick, you want to find relief fast! Next, print off as many of these Medicine Trackers as you’d like. I have a large one (two pages) for our medicine cabinet so I can keep track of what we have on-hand, what it’s used for, when it’ll expire, and any notes – such as if anyone’s allergic, side affects (does it make you drowsy, etc.) and other important things. I also use this sheet to keep track of when someone has received medicine, the dose, and what time it can be given again. 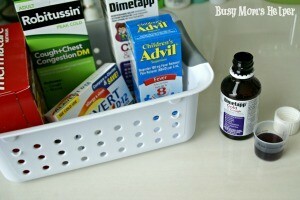 This definitely comes in handy with four kids that have various illnesses at different times! Again, I have a sheet for each family member and just tape it inside the door of our medicine cabinet. Now you’re stocked up for the winter season ahead, know exactly what you have on-hand and when it’s time to discard it, and can record the medications for your family as they receive them. Pretty simple, right? Hopefully none of us get frozen into our homes this year, but if we do, we’ll be ready! Who loves a pretty, fun and colorful planner to organize your life with? I sure the heck do! So I’m thrilled to give you guys even More Pages for our Printable 2015 Planner! Check out our newest planner HERE for 2016-2017, or just 2017! I’ve been loving my 2015 Planner (goes from August 2014 – end of 2015, so you can start using it now! ), and it has so many fun things. You can check out the entire first part of the planner HERE and print off the calendar, daily tasks, and several adorable cover designs to choose from! For today’s special bonus, though, one of our AMAZING readers designed some other cute pages, and she is so sweet to let us share them all with y’all! Thanks so much to Resi for all the time she put into these….she’s definitely got a creative talent! *Please note: sizes for these additional pages may vary slightly from the original printable 2015 Planner, so pay close attention when printing. If you want to contact Resi for some craft or printable work, or questions about her prints, you may email her at leonardandresi (at) hotmail (dot )com – be sure to put ‘Danielle Reeves Planner’ as the subject, so she knows it isn’t spam! 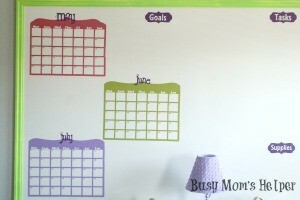 Do you get more or less organized during the summer months? For me, it’s a loud echoing LESS! I have piles of papers needing filing, random craft supplies are covering my kitchen island, and our regular chores have been all-but ignored! So in the spirit of getting back on top of things, I created a new way to switch our daily meal jobs…this super-cute DIY Kitchen Chore Plate! I figure the only way to get our household organized and clean again is to just back on the chore-wagon! We started back with our Family Chore Chart this week, so I’m already feeling a little more on the ball. As for our meals and the disasters messes that accompany them, this Kitchen Chore Plate has helped us keep things in order easily, even for the young kiddos! Sorry, but I had to blot out the names on the pins for these images 😉 Another bonus for this little craft? It cost me about $2! Say what?! Yup, totally budget-friendly and takes so little time. Write the names of the family members on the clothespins. I did it on both sides, one right-side up and one upside-down. This way as it goes around the circular plate, you can flip it as needed and names will always be readable! Attach your lettering to the plate, adding some fun chore stickers as well. I cut out my vinyl using my Silhouette Cameo, which took me a whole maybe 10 minutes to design, cut and attach. Love how easy it is! Hot glue your ribbon onto the back of the plate, and hang. Clip on your clothespins to assign people their chore. Then just rotate easily! 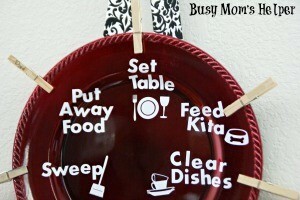 See, it couldn’t be much more simple to create this Kitchen Chore Plate! We love it, and even the kids love as we rotate the pins and see what job they end up with next. If you’ve gotta clean up, may as well have fun with it, right?! With 4 little kiddos, we get a LOT of cute little art projects piling up. It seems to just grow up off the counters, out of the walls, and stuffed in bedrooms. It’s everywhere! In the past, I’ve been terrible at displaying it in an organized (and even semi-attractive) manner, but no more since I did this Quick & Organized Kids Art Wall! Yes, we’ve dealt with our dining room wall being that cluttered, random, totally-overrun mess for a year now! I know it’s been that long, since we moved in just over a year ago! Between the preschool projects and at-home art fun, my kiddos just have too many ‘masterpieces’ they want to display. With my new Organized Kid’s Art Wall, they can each pick their 3 favorites and they’re nicely up on our mini-gallery wall! Paint your boards the desired color. Add your vinyl lettering. I used my trusty Silhouette Cameo and white vinyl, and even had my kids pick out their own fonts when I was designing them! I did use my kid’s actual names….but I blotted them out in these pics and put their Superhero names (code-names), since I don’t openly share their names on here. 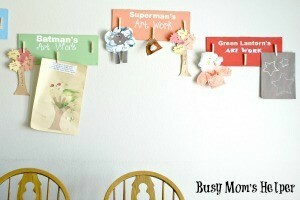 Glue (hot glue worked great) your clothespins onto the board, then attach the boards to your ‘art gallery’. Display their fabulous masterpieces for all to see! We went from this disaster…..
….to this fabulous, organized and attractive Kids Art Wall! I’ve been so STOKED all week long (well, two weeks, but whatever) to finally share this huge project with you. While I love sharing quick and simple things with you all, there’s just an extra ‘awesome’ factor when I’ve worked literally days/weeks on something! This is one of those, and I’m absolutely in love with the end result! 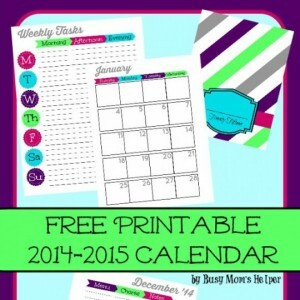 Without further ado….our Free Printable 2015 Planner! I’ve had so many of you who loved my 2014 Planner, and have been asking when I would release next year’s….well, TODAY is the answer! I was hoping to have this out in July, but with vacation and everything time just ran away from me. Time’s still not on my side, but I was just too excited to not squeeze it in. I’m so dang in love with the fun colors, organized layout and fabulous cover choices….I hope you love them, too! There’s so much fun to share with this Free Printable 2015 Planner, I’m not quite sure where to start….so how about at the beginning with our SEVEN colorful Cover Options?! Print your monthly spreads here, starting with August 2014! Now you’ve got to be able to plan out your days, right? One of my very best friends for, well, EVER (love ya Val!) suggested I break it down into Morning, Afternoon and Evening…and that’s what I did! On the left page of this 2-page spread for each week you’ve got the weekdays divided nicely with plenty of space to plan out your To-Dos. This page is the same for all weeks and months, so just print out multiples of this Weekly Tasks Page! For the right side of each week, you’ve got the dates nicely matched for each day, then you have lines to list out your Menu, Chores and Notes for each day! Go below to print out each week, in order, starting August 2014! Because so many of you requested a Notes Page, I figured I better get one up quick! Plenty of lines for jotting down ideas, thoughts and other random tid-bits you may come across. I’ve got my planner ordered and am just waiting for it to arrive, but can’t wait to share more photos when it arrives! I just couldn’t put off posting this for y’all in the meantime, so you can get your own Free Printable 2015 Planner ready! Enjoy!!! 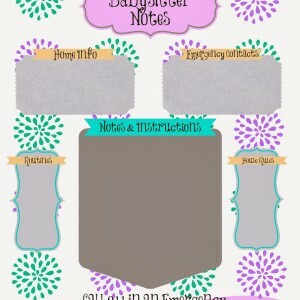 Now Even More Free Printable Pages To Add – Here!!! Running a blog is hard. That’s just the truth of it. For those that think it’s all easy-breezy and ‘she must have so much free time’, sorry to burst your bubble! I’ve yet to meet a blogger that says it’s easy. There’s just SO MUCH to manage, and it’s super easy to get overwhelmed and frustrated. One way I keep myself sane (and loving blogging) is my wonderful blogging command center. This is How I Organize My Blog Planning! Although I have other methods for organizing other blog-related tasks, such as my social media and sharing, this huge dry erase board is a big part of my blog planning. This board came from Hubby’s work…they were just going to throw it out, so he saved it for me. LOVE YOU, BABE! If you saw my Craft Room Reveal post, you saw how it looked BEFORE adding the trim on the edges. A bit ugly…but it worked well. Add the painted trim, and the eye sore was now a nice, clean….emptiness begging to be filled. I decided to make it my blogging command center, and it was the PERFECT place to organize my blog planning! First thing, I planned my layout and such on my laptop, then cut out my vinyl using my trusted Silhouette Cameo! I wanted the months BIG…so had to print the actually grid part of the calendar (bottom right) separate from the top swirly edge (middle right). More on that in a minute…. It took awhile, but I VERY CAREFULLY got the vinyl from the sheets and placed as perfectly as possible onto my dry erase board. Okay, so see how I just carefully placed the top swirl piece just barely overlapping the top row on the grid part? It’s pretty clean and smooth on the green calendar, but notice how it printed slightly off-sized on the top pink one? Ya….that was my bad not fixing the size first. Oops! Still not horrible, though! Since the text for the MONTH is separate, I can keep the calendar themselves up but switch which months as I work throughout the year. I just write the actual dates in the calendar with a dry erase marker, so that’s easily changed as well! Track my recently done posts, helping me not post things too similar, too close together. See what I have coming up, so I can prepare and plan. Since with blogs it’s wise to post holiday and seasonal themed posts awhile before the ACTUAL time, this helps me see ahead. So I know what stage each of my upcoming posts is in, I use a different color of dry erase marker depending on what I need to do with that post. Red = haven’t started, need supplies. Yellow = post is done, but I need to take/edit photos. Green = post and photos are completely done, post is scheduled. Blue = post has gone live and I’ve checked links/etc. are working in that post. How do YOU keep your blog planning organized? Since our kids are getting older and needing more responsibility, plus ways to earn money for their extra wants, I wanted a way to organize chores. After looking at a few different types of charts, I decided to put together this super-cute, but totally simple, Family Chore Chart! For those that saw, I was part of the launch team for Dave Ramsey and Rachel Cruz’s (Dave’s daughter) new book Smart Money, Smart Kids. It was PHENOMENAL, and has so many great tips for helping raise kids to be successful with money (and life)! If you missed my general review, check it out here. After reading it, I realized that I haven’t given my kids opportunities to learn responsibility, or any experience with money. That’s where this Family Chore Chart comes in! Now, we do still love our Chore Rewards Treasure Chest, but the kids weren’t learning the money aspect, and it was difficult to separate the paid vs. non-paid chores. So we still use that to earn things for good behavior and ‘as a family’ type things, but for the normal chores this has now proven to work better for us! Use the BACKSIDE of the foam board to measure everything out. This way you know how things will fit and how you like the layout. Get your measurements from this. Gather your scrapbook paper for your pockets. NOTE: I did a different color for the pockets, so I could then color the popsicle sticks to match, according to which one they belonged to. According to your measurements, cut out your pockets. I wanted to keep the commission (paid) chores separate from the normal ‘because you’re part of this family’ chores, so I did one pocket for each. I then did a 3rd DONE pocket, so they can put their sticks in there when the chore is completed. Gather your scrapbook paper for your pockets. NOTE: I did a different color for the pockets, so I could then color the popsicle sticks to match, according to which one they belonged to. Fold the sides of each ‘pocket’ under, add glue dots to the sides and bottom, then attach it to the FRONTSIDE of the board. Add your vinyl to each pocket (mine says ‘family’, ‘paid’ and ‘done’) or write with markers. Take your desired scrapbook paper and cut out a top border/banner for the top of your chore chart, and attach it with glue dots. Add your Title/Main Banner (for me it was Family Chore Chart) across the top, as desired. I just ‘scribbled’ with colored pencils under where our names would go (different color for each person/row), then applied the vinyl names over that. Take the popsicle sticks and write a different chore on each stick. I colored the ends of the popsicle sticks to match which pocket they would go into. For example: Make Your Bed is a family chore, so I colored the end blue so the kids know it goes in the blue/family pocket. I wanted to have extra jobs available for those times the kids want/need to earn some extra money, such as for an upcoming event that they must pay for. 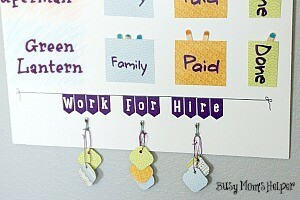 So along the bottom of my Family Chore Chart, I put vinyl saying ‘Work for Hire’ then just drew a cute little banner string. For the tags, I cut out a 1″x1″ square of scrapbook paper, used a ’rounded corner’ punch to make the corners nice and rounded, hole-punched each one and tied a string through. On each tag is listed an extra chore. I used strong tape to secure some photo hangers, then from that I hung the tags. I’m FINALLY done!!! It’s taken weeks (possibly months, depending on what you consider the ‘start’) for the remodel of my craft room, but I’m finally ready to share it with you all. I wanted it to be MY space, the one room that I could do however I wanted, escape to and just create by and for myself. Success!!! 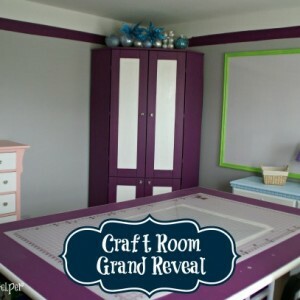 Without further ado…my Craft Room Grand Reveal! Contains affiliate links that support this blog at no extra cost to you. See our Disclosure Policy for more info. Fair warning: LOTS of photos ahead! But I just HAVE to show this off, since it’s taken so much time, effort and just down-right will-power to get this thing done. I wanted my craft room to be ORGANIZED, BRIGHT, and ME (although I’m technically not organized, but that’s we can pretend)! Yup, that needed to be fixed. Like ASAP! My amazingly-wonderful-totally-awesome Hubby gave me the green light, and to work I went! To start, I had to drag EVERYTHING but some furniture out of the room, down the stairs, and pile it up in the garage. Needless to say….EXHAUSTING! Then….to painting! For my colors, I knew I wanted something fun and BRIGHT. It’s a craft room, after all, so colorful-but-not-too-crazy. I chose white ceilings and Pebble Grey walls. I brought the ceiling line down a bit, then put a stripe of my accent color, Boysenberry Blast, between the grey and white. For my other colors, I stuck with some light pink, light blue, greens and yellows. Like I said, FUN yet BRIGHT. I decided to just keep 3 of my random yard-sale found furniture: 2 dressers and the corner armoire thing. Since the corner one is a big part of my craft room, I painted over the black with the Boysenberry Blast. It was a bit TOO much accent, so I then made the panels white. The dressers I did the pink and blue. Add some new, matching knobs and they were set to go! I also framed in the dry erase board so it had a nice, clean border. The green was very bright, but I ended up really liking it! I’ll be doing a tutorial soon on how to make your own craft table, so stay tuned for that! I nabbed 2 cheap bookshelves from walmart to stick under the ends of the table, for some extra storage. Love how organized most of my ribbon is now! I do still have a whole drawer-full (I may have slight ribbon addiction), but at least these are easily accessible! I also got an Expedit shelf from IKEA for under my windows. Good storage shelf, seat and bench for reaching my curtains! If you’re curious about my curtains, I did a tutorial on How to Make Curtains: Or Not! Learn how to make them the right way…and how to fix some if you happen to make a big oops like I did! Another fun file organizer, nabbed from IKEA (ya, LOVE that store)! The corner shelves are a fun decor aspect to the room, plus a great place to put some jars! Notice the button-filled jar? Ya, Hubby still can’t understand why I have so many….but that’s ok! I picked up these wonderful organizing trays and peg board items from The Container Store. Handy for holding many of my frequently-used things. LOVE how easy it is to find things, now! Including my well-organized Simplicity patterns….they’re fabulous! Then it was just a matter of adding some pops of color and decor…one of the most fun parts of remodeling a room, if you ask me! Since I’m attending SNAP! Conference in just a FEW DAYS (eeeeek, can’t wait! ), I plan on finding a bit more decor to fill up some empty spots…like this very large wall that’s just begging for some cute stuff! I’m just SOOOO in love with my new craft room, and have been really enjoying my time in there now that it feels so clean, organized, bright and BEAUTIFUL! I have a confession: I’m VERY picky as to who I leave my kids with. After a babysitter stole our Ipad (passed it to her boyfriend and had it sold) before we even returned home, I’ve become really cautious. When I DO leave my kids, I make sure it’s someone I trust completely. Along with that, I want to make sure they have ALL the information they’ll need for a successful night, for them AND for the kids! This printable Babysitter Information Form is perfect, just in case there’s something you forget to mention, or they don’t remember ALL the stuff they were given right before you walk out the door. Home Information: your home address, phone number, etc. In case they need to give an emergency person that info, or are ordering a pizza. Emergency Contacts: This is where we put a trusted neighbor that’s close by, and near by relatives that can be contacted just in case. Notes & Instructions: Here we put things like allergies, if someone needs some medicine at certain times, what meals are planned, etc. Routines: When they play, read, clean up, eat dinner, brush, bedtime, etc. House Rules: General rules, and what form of discipline to use (we use ‘take a break’ here). Non-Emergency Fire & Rescue: As it says, put the number for the non-emergency important rescue people. Like dispatch, etc. What else do you think should be included?